Various options combined with high performance and a relatively low purchase price make the tine seeder ts-drill a real alternative among crop establishment systems. Especially in extreme conditions for example, humid soil or high straw residues, the advantages of the ts-drill become evident. The intelligent arrangement of the seeding tines over five rows allows the ts-drill to place the seeds accurately into the seedbed. The flexibility of the ts-drill allows its operation after the plough as well as with conservation tillage. Plug & Play! Using an industrial standard, the machine is connected directly with the ISOBUS terminal of the tractor. With the easily accessible new metering device Kverneland are setting new standards. The intelligent arrangement of the seeding tines over five rows allows the ts-drill to place the seeds accurately into the seedbed, even in conditions with high amounts of crop residues. The symmetrical distribution of the rear row of tines ensures excellent seed depth and levelling. The ts-drill can be ordered with tine spacings of 12.5 or 15cm. The seeding tines of the ts-drill are made of high quality spring steel fitted with the Kverneland leaf-spring autoreset overload protection. To ensure the free flow of crop residues through the machine, the tines are arranged in an off-set configuration over five rows. The special design of the tines reduce the tractor power requirement and ensure uniform seed depth placement. Also in extremely humid and sticky soils, the ts-drill ensures perfect seeding results. A tine in front of each landwheel levels the soil and ensures an even and steady running of the ts-drill - a prerequisite for the depth control of the seed placement with tine seeders. Due to the new design of the ts-drill, seeding can be carried out in a crossways direction to the previous cultivation operations. Equipped with the largest profile wheels of all machines in its class (11.5/80-15.3 10PR), the ts-drill offers significant advantages. The large diameter wheels of the ts-drill run smoothly and easily. The tyre pressure (approximately one bar) ensures the “footprint” of the machine being significantly reduced. Deep wheelings are avoided whilst the seed bed is protected against compaction. The seeding depth is adjusted, without the need of any tools by using spacers on the wheels mounted in the centre of the main frame. This guarantees that the ts-drill will adapt perfectly to the ground contours and the sowing depth is simply more precise. Effective seed covering after sowing is ensured by the twin row precision following harrow section as standard equipment. The special design of the tines allows even high quantities of damp plant residues to pass through the harrow without blocking. Optional the ts-drill can be equipped with the 2 row finger harrow for extremely stony conditions. The harrow pressure and its aggressiveness can be adjusted via the spring pressure adjustment and the angle of the harrow bar. As a second option the ts-drill can be equipped with a one-row V-harrow and press wheels. This offers the possibility of applying additional pressure. If the seed press wheels are not required due to very humid conditions, they can be completely lifted. 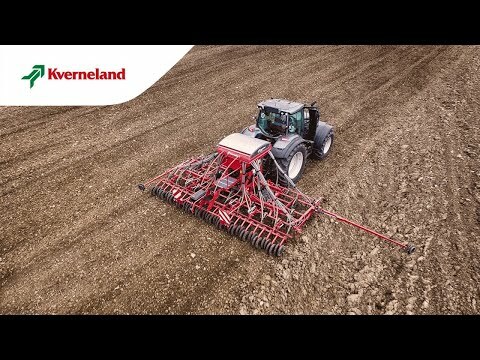 Kverneland Group offers an optional seed flow check system for pneumatic seed drills. This is an independent system which monitors the seed distribution tubes immediately recognising and reporting any blockages or errors. The display indicates the affected seed delivery tube, making it possible to localise and remove the problem quickly. The system is suitable for all common seed types and can be fitted retrospectively on all pneumatic seed drills.